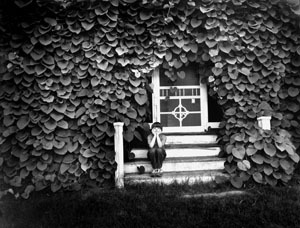 The SIT DOWN collection began with a black and white photo of a boy on a porch sitting on time-worn, wooden steps with a screen door behind him. The front porch is tightly encased in a vinelike plant called Dutchman’s Pipe, so overgrown that you can’t even push open the door. The boy is killing time, lazy, bored, waiting for the next great thing to happen in his life. The porch belongs to Mid Hale, an elderly woman who’d spent most of her life in that house. Behind that screen door, she’d raised five daughters, fed her family franks’n’beans every Saturday night, baked her famous yellow jello cake with cherry icing for after-church receptions every Sunday afternoon. “No, but I can see out,” she’d reply. Or maybe it didn’t happen that way at all. It’s always a guessing game. No matter how much is known when you take a photograph, you’re often compelled to wonder what brought this person to this place at this time. What was he doing a few minutes before or after the photo was taken. Are you getting the story right, and does it even matter. Usually I take a photograph because a certain gesture catches my eye. Something about the posture, or the relationship between people, or the way the light captures the moment, makes me unscrew the lens cap and advance the film..